Hi my name is Joseph and I am a teacherâ€™s assistant for Evergreen 6. 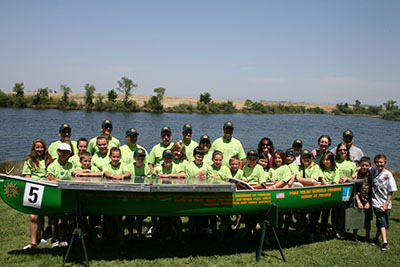 I went to Evergreen 6 last year and was part of the Northern California Solar Regatta. We started building our boat from scratch last year. We had no boat or motor. We put out a Craigslist ad asking to buy a cheap boat. We had someone respond saying we could have one for free! We got the boat within a couple of weeks of the reply and started working on it. We worked on our solar panels at our first meeting. We tested the five panels SMUD (Sacramento Municipal Utilities District) gave us to see which four panels put out the most watts. We learned how to wire the four panels together in parallel. Someone on the regatta team had a 24 volt wheelchair motor lying around so we hooked our panels up to it and pressed the ON button. The motor didnâ€™t spin, so already we knew that we couldnâ€™t run a motor that used that many watts and amps. We kept working on it and we found the right motor which was a 24 volt 350 watt motor. We had this great plan on how to mount the motor too. A small group of Solar Regatta members stayed after school on one overcast Tuesday. They drilled through the bottom of the boat and attached our motor container. 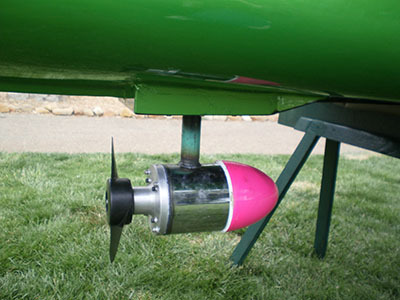 It was made from an old section of a gas line, part of a wrecked semi-truckâ€™s exhaust pipe, and half of a giant pink Easter egg (for hydrodynamics). It worked perfectly until we found out that our motor was burning up during a test run at Paradise Lake. We had to redesign our idea. One of the regatta members had the idea of coating the motor in spray able truck bed liner, that way it would be waterproof and colder. Designing how to put the panels on the boat was another task we worked on during the first couple meetings. We came up with a simple, yet efficient way to mount our panels. They wired them all together in parallel using conduit piping. Then we mounted them on the middle of the boat. The panels werenâ€™t able to tilt but the races were to take place around noon, therefore it wouldnâ€™t affect our energy productivity too much. Then we were able to get the boat painted a racing green for free. Brittany Mittagâ€™s dad, Shawn Mittag, did body work and painted our boat for free. Then we got decals for all of our sponsors to put on our boat.Â We only had two test runs, one at the public pool, and one at Paradise Lake. The one at the public pool went great. Lots of people came to watch us try it out. They got to see it on the water for the first time. It went great, of course we only went the length of the pool a couple times, but still, it was awesome. Our other test run was at Paradise Lake. It was a private test where all four pilots drove it around the lake. We were able to see how fast it could really go. It was really fun to watch, the boat was turning well and it was going pretty fast too. At last the race rolled around towards the end of May. We were ready to go with our Evergreen 6 shirts and our tents. We headed to Rancho Seco the day before the race to spend the night at the campground. We set up camp and surveyed the race location. Then we went to sleep. The next morning was crazy. We had breakfast and the towed our boat to the race. We got there early to set up an Evergreen 6 area with our solar ovens and recycling bins. 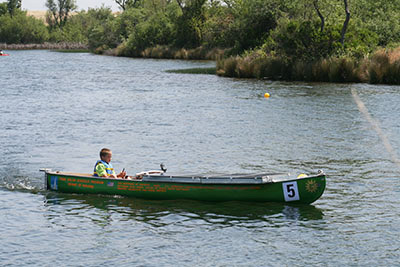 When spectators started to get there we put our boat by the entrance and talked to people about our boat and solar. We also talked to them about all the recycled materials we used making our boat. When the races started we carried our boat down to the dock. We were in the second race for endurance. The endurance race was a thirty minute long race that went in a long oval shape. We started off great and kept up with our competition. Around the twenty minute mark, our boat started slowing down. We didnâ€™t know what was wrong. Our boat ended losing to our opponent by about one lap even though our boat kept getting progressively slower. When we took it out of the water we could smell a burnt rubber smell. We found out that it was coming from our motor. So, we opened up the motor and found that the rubber casings around the motor wires were melted. So we asked the officials if we could change our motor and they said yes. So we changed it quickly and got back on the lake. The last two races: slalom and sprint, went by fast. We didnâ€™t race anybody though, we were just timed. It was really windy when we raced and the wind kept pushing us to the side. It was difficult for our pilots to control the boat but we did finish. When it was time for us to see who won, we all sat as a group and waited for the results. Evergreen 6 didnâ€™t win any categories but we were happy with our effort. Laguna Creek won overall but, Laguna Creek was the team that we only lost to by a lap in the endurance race so we were proud. This year we are racing again with some new kids and some kids from last year, myself included. We are figuring out a way to tilt our panels this year. We are using the same boat as last year with some adjustments. Thanks to our sponsors last year we still have enough money to do this again. 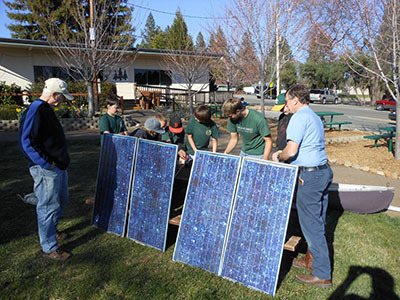 A big thanks to PG&E Solar Schools Program ( Our largest supporter financially. ), Rotary of Paradise ($500 grant), SMUD (Sponsoring and organizing the event), K.G. Thompson Construction, Mittag’s Auto Body, Matthew’s Roofing, 7up/RC of Chico, Favor Software, Ace Hardware of Paradise, Abshier’s Blacksmithing, Durham Batteries Plus, Chico Paradise Recreation and Parks District, and Nick Knezic – Boat Decals. — Greg Holman at Paradise. Joseph Levin is a 7th grader at Paradise Intermediate School. Joseph enjoys playing baseball with his friends, riding his bike, and hanging out with his friends. He is a hard working student and athlete and doesnâ€™t complain. This entry was posted on Wednesday, May 1st, 2013 at 11:44 pm and is filed under General Info . You can follow any responses to this entry through the RSS 2.0 feed. You can leave a response, or trackback from your own site.